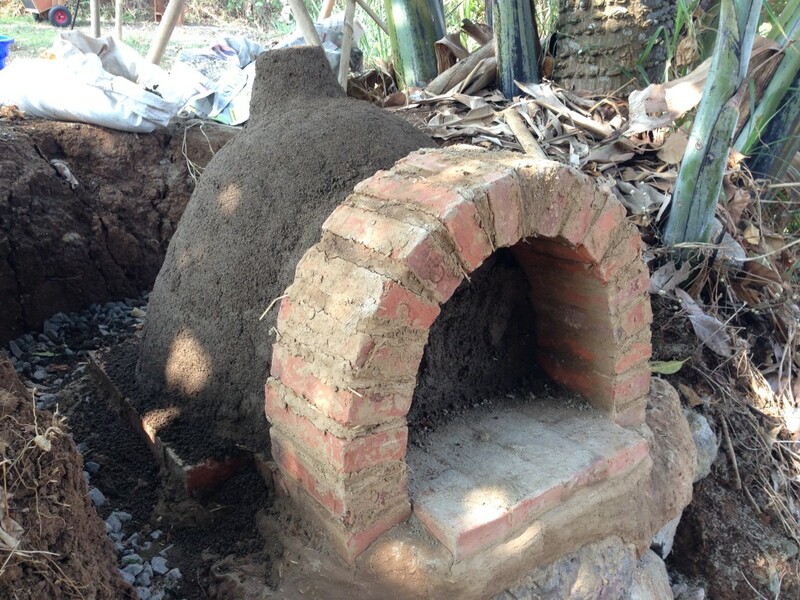 You will use your first batch of cob to build a flat surface onto your oven base. To do this, form roughly hand-sized balls from your cob-mixture and start smashing them onto the top of your rock base. 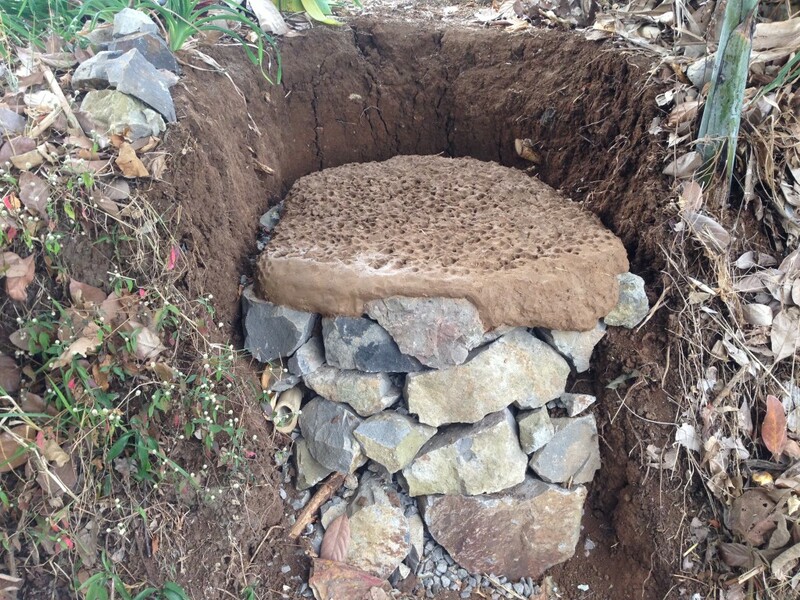 Once the entire base is covered in layer of cob you can use your fingers and knuckles to compact the clay into a uniform mass, smashing on more clay in uneven places to make the whole area as level as you can. The surface should remain nice and wobbly (from your fingers and knuckles), however, to give grip for the next layers. Once you are happy with your surface layer you can make the edges look pretty already (see the picture on the right), then it’s already time to add some bricks. If your cob surface is already quite dry you may want to sprinkle some water on it first, then you can start laying out the bricks. 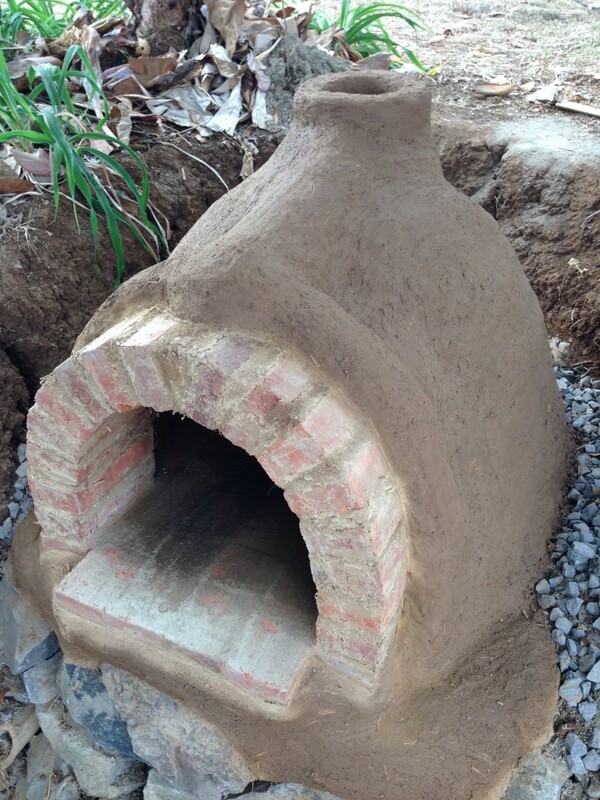 Make sure to make your brick base large enough to cover the entire inner diameter of your dome, as this is the surface on which your pizzas and breads will be baking. Also account for the area where the entrance will be and extend it outwards (see picture on the right). Add one brick after the other, always making sure that each brick sits tightly on the cob layer (stuff some more cob underneath if a brick does not sit properly). 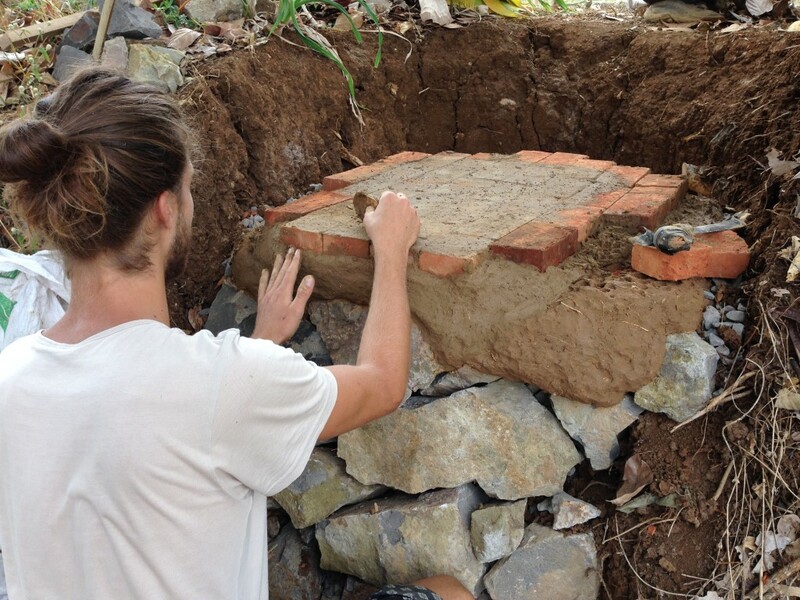 Once all bricks are in place you can spread a very soggy clay-sand mix onto them to fill in gaps in between bricks. This is the tricky part! Think about how high you want your door to be (it should be roughly 70 percent of the inner dome height of your oven) and build yourself a temporary construction that will hold your dome while you build it: we used two bamboo slats, which we stuck in between the two lowermost bricks of our dome, but you can also cut out a support construction from wood – get creative! 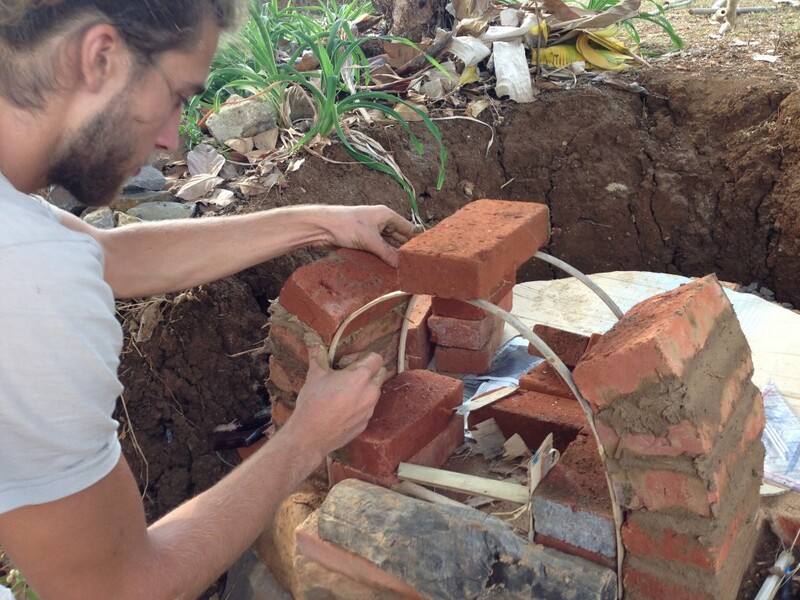 Once your support is in place you can start building up your dome, using cob in between the bricks as mortar. This is not as easy as it may sound, just be patient and keep on trying! Once your arch is up and you have removed the supports once again you can get started on your dome! You will need to pile up moist sand on your brick layer behind your arch and shape it the way you want your dome to look: the sand represents the dimensions and shape of your inner dome. Make sure to account for a chimney at the back of your sand-dome and to connect the arch with sand as well. 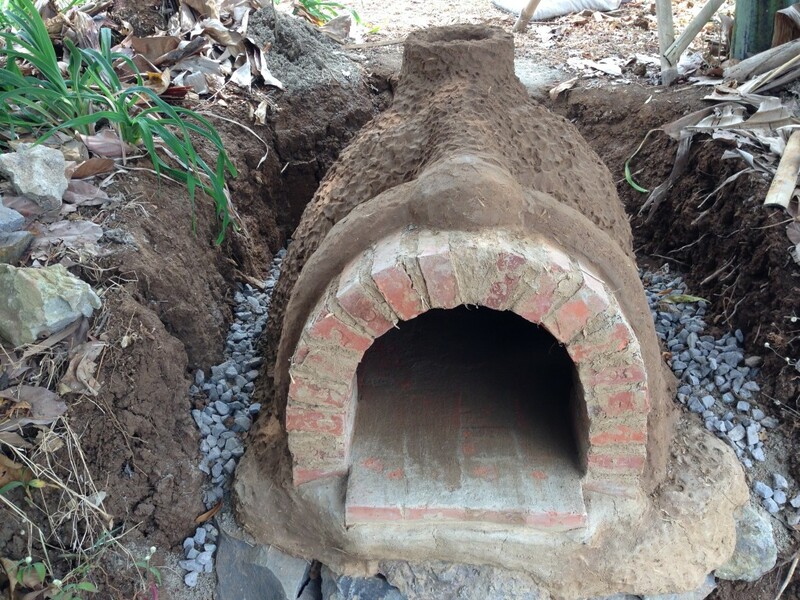 Once you are happy with your sand-support wrap it in newspaper, making sure that no newspaper overlaps onto your bricks at the bottom and onto your arch (if newspaper gets in between your dome will not hold onto the base and the arch). You will need to stomp more cob now, just like before, and then start applying the first layer your sand-dome. Begin by smashing cob onto the edges of the bricks that should be sticking out under the sand and slowly work your way upward (don’t smash the cob too hard, otherwise you will make dents in the sand!). Aim for about 6-8cm of thickness for this layer, make sure to leave the surface nice and wobbly after pressing in the clay with your fingers and knuckles, and don’t forget to connect the arch to your dome! Once your first layer is finished let it dry a little over night and take out the sand the next morning. Now it is time for the second layer: stomp more cob and apply it onto your first layer. This time you can smash it hard on the surface as your first layer should be quite solid already by now. Aim for another 6-8cm here, make sure all your edges look pretty and cover all dents with some extra cob. Your oven is almost ready! You need to let it dry for at least a few days now (some people say 3-4 weeks, but in my experience 6-10 days is plenty). Once the cob has dried out you can start lighting a small (!) fire, which you keep going for several hours. If cracks appear you can simply seal them with a clay-sand mixture. Light a slightly bigger fire on the next day, an even bigger one the day after, and after 3-4 days of fires, gradually increasing in size, you can finally light a big fire for 1-2 hours and start baking!